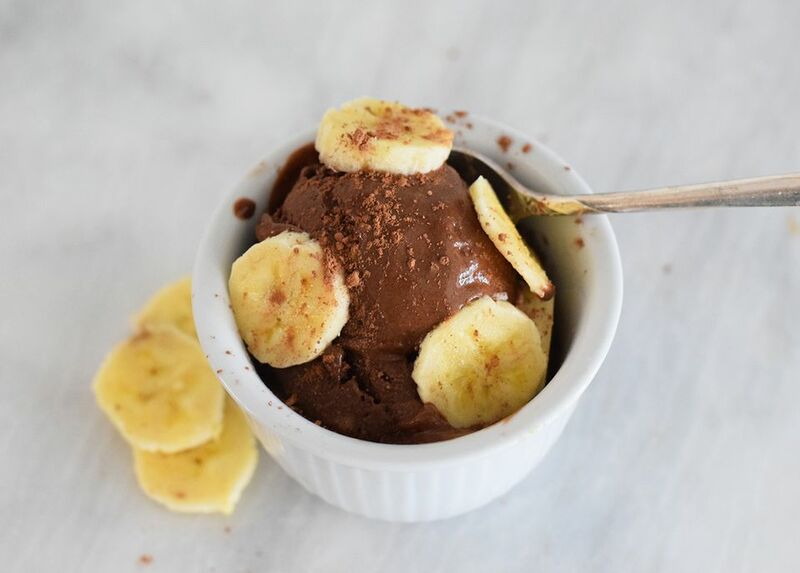 Is this chocolate banana frozen yogurt breakfast or dessert? We're not going to lie, it could really be either. With its intense chocolate flavor and the sweetness of the bananas, you will sure to quickly fall in love and have a healthy go-to treat available in your freezer when your sweet tooth comes calling. All you need is a blender and a freezer to make this frozen yogurt happen. Yes, you read that correctly: just a blender and a freezer. So don't worry about getting out that ice cream maker! You just have to start off with frozen bananas. You can either freeze them yourself a day ahead of time or use the store-bought variety. Whichever you prefer. The honey or agave nectar can be used for a little extra sweetening. The plain Greek yogurt works great as a base, but if you want something even more sweet, you can also substitute in vanilla Greek yogurt. And, if you're looking to cut calories, just use non-fat yogurt and skim milk. The flavor will still be delicious! Based on the below recipe, you should be able to get around 3 or 4 servings. It scoops very smoothly after you set it on the counter for a couple of minutes before you are ready to serve. Just make sure to top it all off with more banana, because honestly, there's never too much banana. For a complete breakfast treat, try adding things like granola, shredded coconut, chopped nuts, or nut butter. It will eat similarly to an açaí bowl! Add the frozen bananas, sweetener, yogurt, milk, cocoa powder, and vanilla to a blender or smoothie maker. Make sure your blender is strong enough to liquify. Liquify the ingredients and transfer them to a freezer proof bowl or Tupperware container. Cover well and freeze for at least 6 hours. When you are getting ready to serve, take the container out of the freezer and set it on the counter for about 5 minutes to let it soften just slightly. Scoop and divide the chocolate frozen yogurt into two bowls. Top the frozen yogurt with the sliced bananas and sprinkle with more cocoa powder if desired. You can easily make this recipe vegan by using vegan Greek yogurt and vegan, plant-based milks.